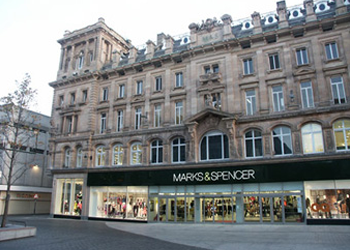 On the Liverpool M&S Flagship Store Project the architect’s brief was for the stone load bearing structural ladder frame to be concealed above the curtain walling. This was integrated within the curtain walling and within the mullions we installed a strengthened section that augmented the integrity of the assembly. To ensure that design redundancy was allowed for if, in the event that a mullion suffered damage, then the Steel ladder frame spanning the opening is strong enough in its own right to retain the stonework. Should the resin anchor fixings in to the sandstone substrate suffer then the Mullions can withstand the Stone loads. The top and bottom of the mullions had reinforced plates to take the shear loads for the project specific wind loads. System 2000 Group Ltd worked closely with the Architects on a project that was time critical and, at the same time, worked within a time constraint of a rolling program that meant that some issues of design could only be discovered until at a late stage. Some of these changes had to be carried out via MS remote desktop direct into our in-house CAD facility over the internet – revised cutting lists, for example, being implemented direct from site. 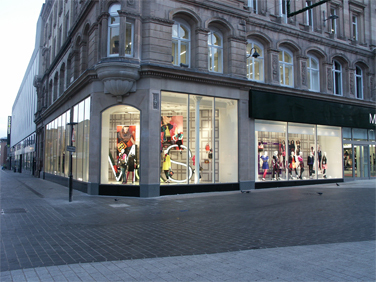 The main Entrance on Church Street included integration of telescopic sliding automatic doors to give a maximum of clear opening within the differing levels, including rain flow surface water flow studies, the levels for the whole of the ground floor was carried out by System 2000 working in close harmony with Wates Expert Surveyor, enabling the design and procurement of materials / glass and long lead time items and the like to be done off design drawings, working in close collaboration with the Stonemason, we all needed to have Confidence in each other. This is a very impressive building. To think that the majority of this was covered in a modernization program carried out in the 1970’s. The re-instatement, in our opinion, was well worth the effort and is something that all involved with the project can be proud of – work included design and installation of concealed steel to support existing stone.